Below is the 2018 annual financial report for the club, submitted by Ron Peck, 2018 treasurer. Take your love of running and the running community even further—join the Central Maine Striders board! Three board positions are open, or will be shortly, and the club needs individuals who can step up and support and grow Striders. Terms are two years, with the option of one renewal. Club meetings are held approximately nine times a year and are casual and social events. Come hang out with fellow runners! The Secretary is responsible for recording the minutes of board meetings, ensuring their accuracy and availability, and keeping membership records updated. Ron Peck, Treasurer, will finish his two terms on the board in December. The Treasurer is responsible for the club’s financial accounts. Alicia MacLeay, Communications, will finish her two terms on the board in December. The Communications officer oversees the club's web, social, newsletter, and other communication, plus updates the Maine race calendar. Help continue our legacy as the oldest active running club in Maine. 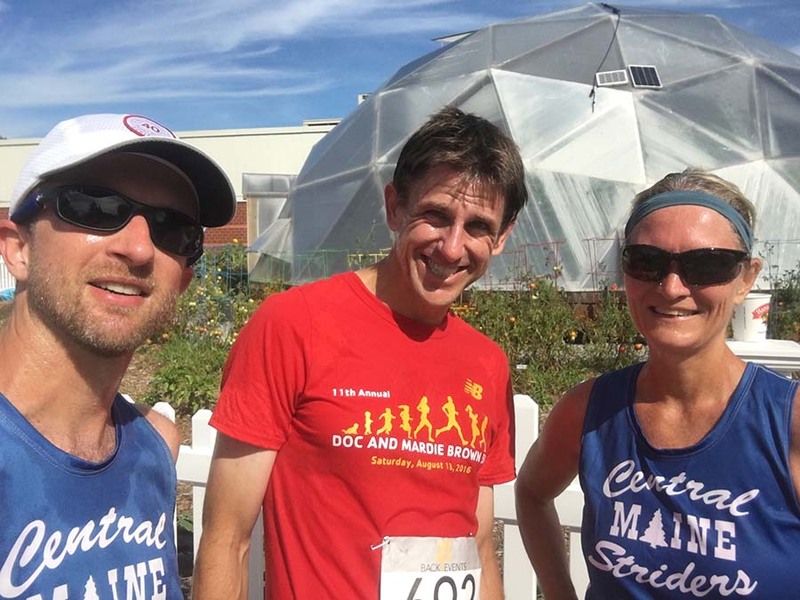 If you can help with any of the above, please send an email to run@centralmainestriders.com, come to a monthly club meeting, or reach out to a current board member. 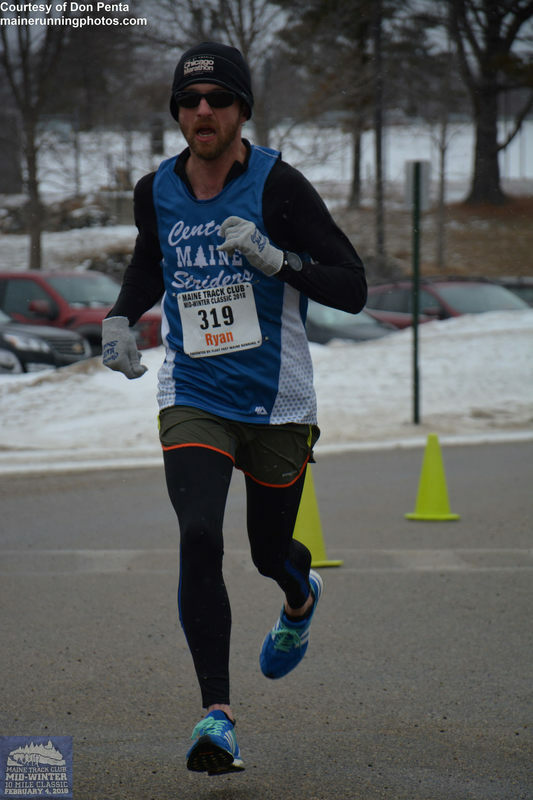 Established in 1975, Central Maine Striders is the oldest, active running club in Maine, and is a completely volunteer-run organization. The club is open to all interested runners and serves runners of all ages, abilities, and interest levels in the Central Maine area. It is hard not to run a race that starts less than a mile from your house. That’s probably the main reason I ran the Doc & Mardie Brown 5K last year and again this year. 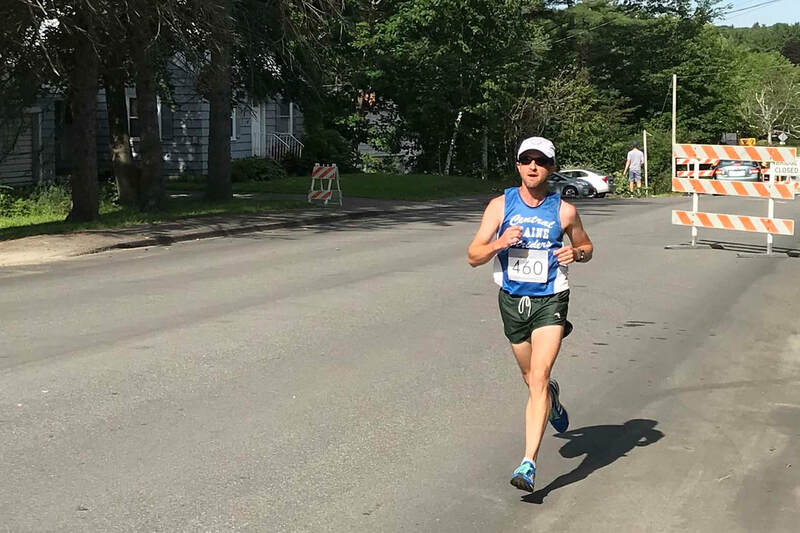 In the race last year, I was new to Maine and didn’t really know what to expect from the competition and from the course. I managed to place second overall and win the 40-49 male age group division with a time of 18:38, which was 29 seconds behind the overall winner. 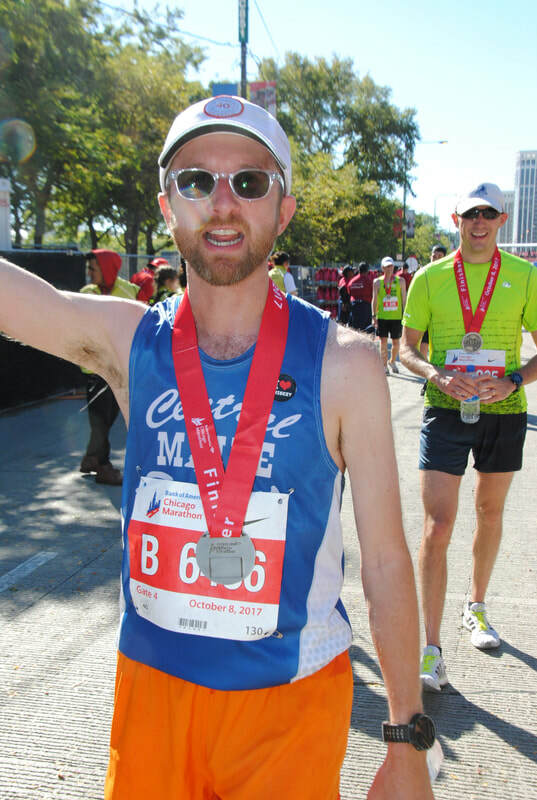 Having never actually won a race on a certified course before, I immediately put the thought into my head that I wanted to come back in 2018 and win this race. The Doc & Mardie 5K course is by no means easy. In fact, it’s the hardest road 5K that I’ve ever run. 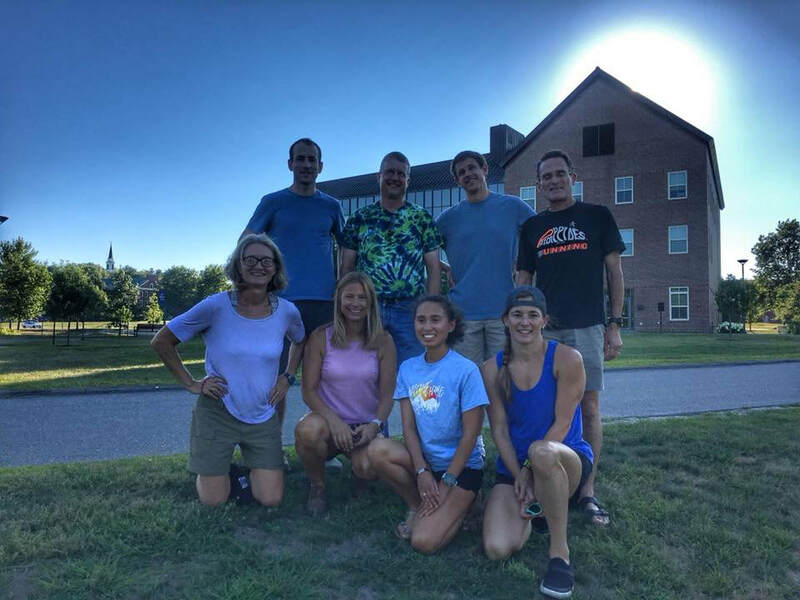 The first mile includes an elevation gain of 128 feet, most of which is over a quarter mile while you climb up the hill to Colby College from North Street. How you run up this hill can make or break your race, and I was determined to conquer it. So, I ran up this hill frequently during my training, including seven times in the week prior to this year’s Doc & Mardie 5K. I made several attempts at capturing the Strava segment “course record” from fellow Strider Ron Peck, but continually failed. The only thing I could hope for was some race day magic to propel me up the hill at the pace I wanted to run. Going into the race, I gave myself about a 50 percent chance that I could win it. My running has improved a lot over the last year, including cutting nearly 30 seconds off my 5K PR, but I knew there was no guarantee that I could beat the winning time from last year. I was also afraid that a random Colby College kid would show up and blow me away. On the morning of the race, I jogged from my house to the YMCA to pick up my number and t-shirt and then jogged back home where I changed shoes and shirt and drank some water. Once again, the convenience of racing this close to home can’t be overstated. As I ran down the street heading back to the YMCA and the start of the race, I started feeling a little hungry, so I made a U-turn to go back home to eat a GU energy gel and drink more water. As I chatted with some of the other Striders while standing at the starting line, I looked around and either didn’t see or didn’t recognize the guy who won last year’s race. I also didn’t see anyone else I recognized as being faster than me. I knew that winning was a real possibility now. I immediately shot out into the lead having no idea how close anyone was behind me. I looked at my watch about a quarter mile into the race and saw I was running 5:15 pace. I knew I had to slow down a bit so I wasn’t too winded by the time I reached the base of the hill. As I ran up the hill, I started getting paranoid that someone was right on my tail. I thought I was hearing heavy breathing and footsteps right behind me, but was afraid to look back. Running down Mayflower Hill, I knew my pace would increase, but I didn’t want to push it too much. I knew that the third mile included another climb that may not be as big as the hill in the first mile but still had the potential to zap a lot of energy out of me. I came through the second mile at 5:36 min/mile pace. I was right where I wanted to be. As I approached the bottom of the hill at the Gilman Street bridge, I again thought I heard heavy breathing right behind me. After crossing the bridge, there was a car that seemed to want to drive through the construction barriers. I was relieved to see that race director Patrick Guerette was talking to the driver, but also a tad worried because the driver seemed to keep inching forward. I wasn’t sure whether I should go around the left or the right side of the car. I went to the right without incident and soon after saw my wife standing on the side of the course cheering for me. “Are you winning?” she asked. I was relieved to know that the phantom runner chasing me really was a phantom and I was well on my way to winning the race as long as I maintained my pace to the finish. Of course, knowing that I had a comfortable lead also killed my adrenaline rush. My breathing grew heavier and I felt hot for the first time in the race. Running up the hill on West Street felt much worse than the giant hill in the first mile. At this point, I just wanted the race to be over. I topped the hill and turned onto North Street. “Only a half mile to go,” I thought to myself. I really wanted this half mile to be finished. As I turned into the YMCA parking lot, I saw the race clock counting up from 17:37. I pushed to the finish line realizing that I was going to win the race and run a sub-18:00 time. I had just won a race for the first time ever! I turned around to see the next runners approach the finish and was glad to see that Ron Peck came in second overall and Julie Millard won the women’s race. After I got home and loaded my GPS data to Strava, I found that I had finally beat the segment record going up the big hill to Colby (sorry, Ron). That capped off a great week of running for me: placing fifth in my age group at Beach to Beacon, winning the Doc & Mardie 5K, topping 70 miles for the week, and getting a segment record on Strava. The only thing left to do was to head over to the New Balance Factory Store Tent Sale and spend the gift card I won from the Doc & Mardie race. Thanks to Patrick Guerette for organizing a great race. If you live in the area and haven’t run the Doc & Mardie Brown 5K, you really should consider it. I plan on running it again next year. 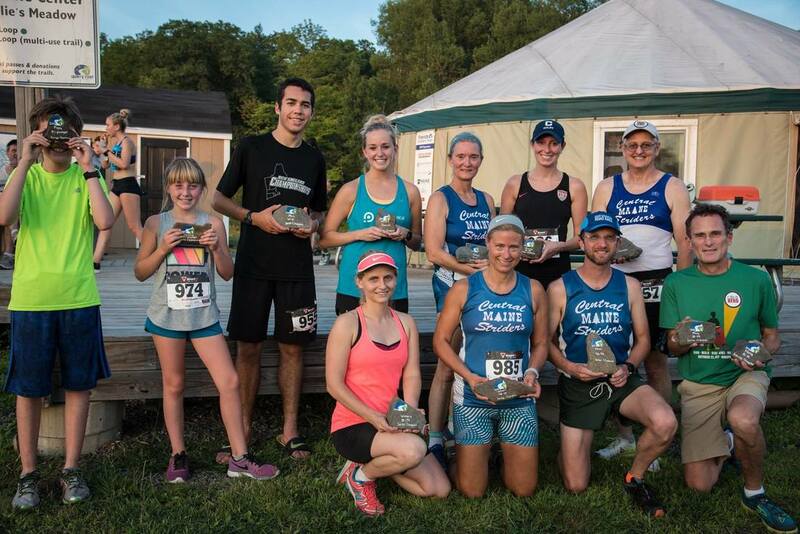 Congratulations to Scott Harrison and Tiana Thomas, the overall winners of the 2018 Quarry Road Summer Race Series! 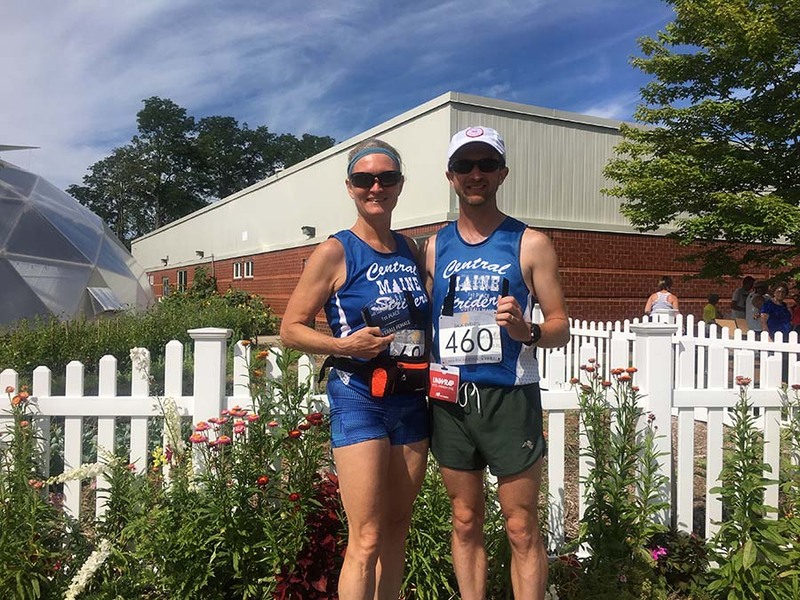 The overall and female and male age group winners were determined by the total of each runner's best 3K, 5K, and 8K race times over the summer trail race series. Thanks to everyone who came out to run each Tuesday night on the trails of the Quarry Road Recreation Area in Waterville! Thanks also to series sponsors New Balance (Series Sponsor), Inland Hospital (Kids Fun Run Sponsor), and Trailspace (Finish Line Sponsor), and to weekly sponsors The End Zone, Selah Tea Cafe, and The Proper Pig. 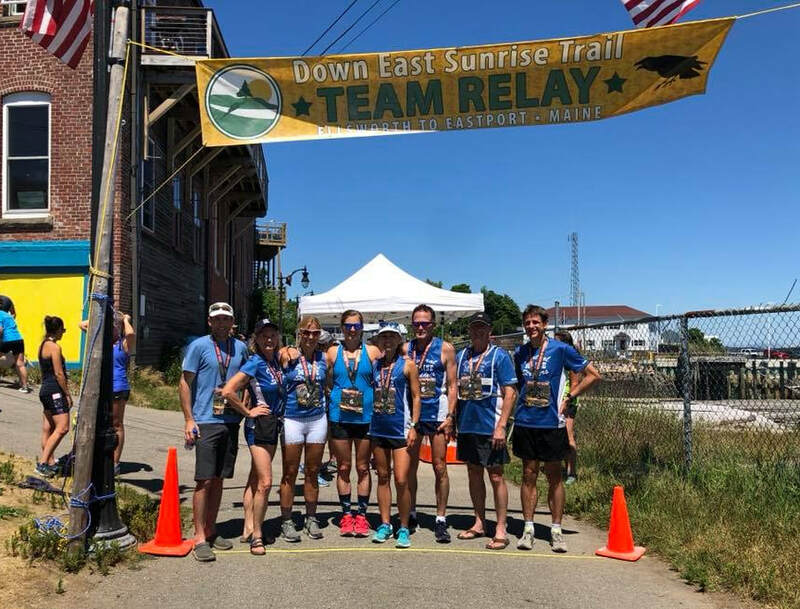 In July a Central Maine Striders team tackled the Down East Sunrise Trail Relay for the second year. In the DEST Relay team members take turns over 16 legs running the 102.7 miles from Ellsworth to Eastport. Teams estimate their finish time and are given staggered start times on Friday night (July 20th) in order to finish around the same time on Saturday ( July 21st). This year's Striders DEST team included Pat Cote, Bruce Maxwell, Ron Peck, Jess Beers, Cecilia Morin, Tracey Cote, Julie Millard, and Brian Morin. Team captain Julie Millard shared the following race report. Friday, July 20, 6:00 p.m. The motley crew assembles on the Colby campus, cramming eight bodies and approximately 37 bags into two SUV’s. Destination: Pat’s Pizza, Ellsworth. The team elders, Brian and Julie, throw in a beer for good measure. Lead-off runner Pat may have let his hunger override his good sense, but all hope that three hours is enough time for him to rest and digest in his camp chair. Friday, July 20, 11:30 p.m.
An awkward seed time of 11:30 p.m. puts our excellent adventurers in the undesirable position of having only one team with a later start time and key rivals with significant leads, likely meaning that they will experience a lot of alone time on the trail. Pat does an excellent job of digesting, runs a powerful leg, and puts our heroes fifth from last. Saturday, July 21, midnight to 4:30 a.m.
Skunks, porcupines, ticks, mosquitoes, blown-out calf muscles, dim headlamps, and a lack of cell phone reception and bathrooms are only some of the horrors the brave Striders faced, with the biggest being the tricks of the mind. (Is that a bear? Is that a serial killer? Where’s my damn coffee?) Somehow the team makes it to Columbia Falls, where the sunrise brings them great joy. Tracey’s calf injury requires a change in plans, with secret weapon Cecilia, youngest team member by more than a decade, swapping into a difficult uphill leg. Despite her strong performance, she is unable to hold off top-seed team Boyz n the Woodz, but she puts the team in striking distance of several teams with earlier start times. Congratulations to the Striders team for their performance at DEST! In addition to a strong finish, for the second year in the row, they also finished closest to their predicted time—within two seconds! Check out their video below. Then consider running the next Down East Sunrise Trail Relay July 19-20, 2019. 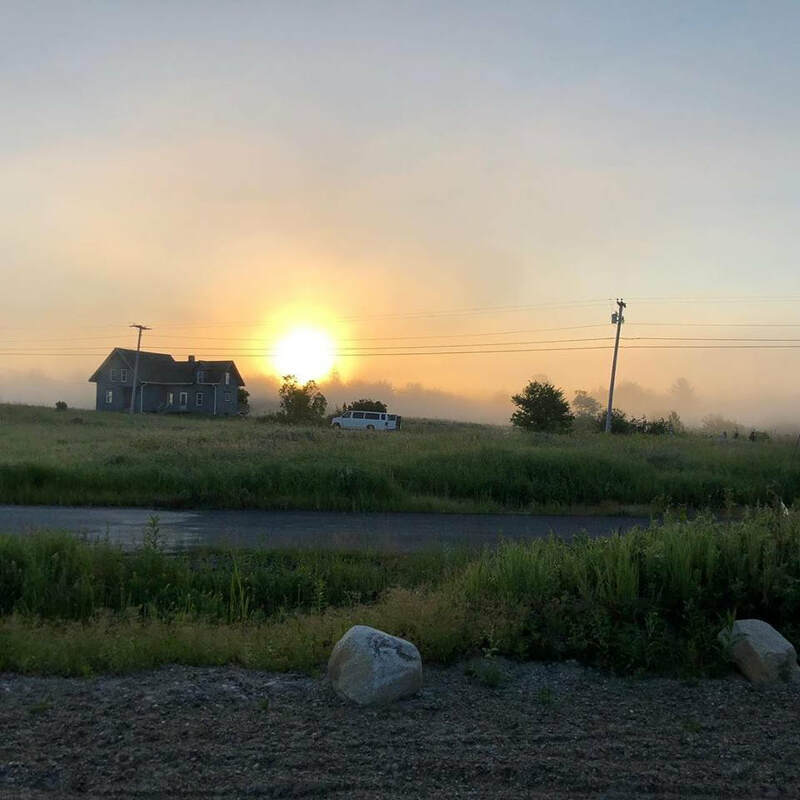 All are invited to join Central Maine Striders for a series of challenging, but low-key, early morning Wednesday workouts in May. Tracey Cote (Striders member and Head Nordic Ski Coach at Colby) will lead a series of informal weekly track workouts on May 2, 9, 16, 23, and 30 and June 6 on the Colby track in Waterville. Meet on the Colby track in Waterville at 5:45 a.m. for a short mobility workout and warm-up. Tracey will bring workouts each week, which can be modified for different levels, shortened, or run by yourself. Participants are welcome to come and go as they like. All running abilities are welcome. 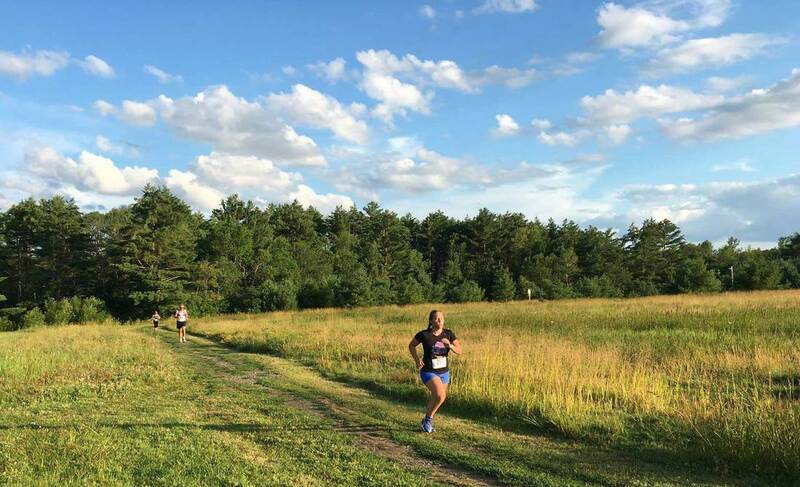 Get ready for the Quarry Road Race Series this summer, which starts on Tuesday, June 12. Or just motivate yourself to do some speedy running with fellow Striders this spring.